When Do Dentists Use Dental Sealants? Sealants are usually applied to teeth on children ages six through eighteen, but some adults find them helpful as well. Dental sealant is used to prevent tooth decay. It is a very thin, plastic coating that is painted on the surfaces of the teeth to prevent buildup of plaque, tartar and decay. While we should never stop brushing our teeth to remove food particles and plaque, we don’t successfully remove everything, and the back teeth are at particular risk. Dental sealants help to protect those areas of vulnerability by sealing those areas against food and plaque. Below are some things that you need to know about sealants at Snellville Family Dental in Snellville,GA. Before applying the sealants, Dr. Nabi and Dr. Socoloff first clean the teeth, examine the tooth structure to check for decay and anything that may still be stuck in the tooth area. Each of the teeth will be dried and cotton or another material will be placed around them. After this, your Provider etches the surface of the enamel to roughen up the enamel so that the sealant will bond to the tooth. The sealant material is applied with a brush. 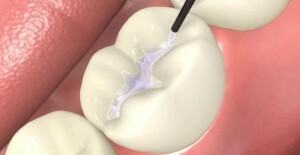 The dental sealant quickly goes into the grooves of the teeth to form a shield over the enamel of each tooth. The tooth is then rinsed and dried, and the sealant allowed to bond to the tooth, sometimes with the help of a special light. The tooth is then protected. The application process for dental sealants is simple and there is usually no pain throughout the entire process. It also doesn’t take very much time for your Provider to apply sealants to all your teeth. It’s one of the most cost-effective options for helping your teeth last a lifetime. When you are have your regular dental checkups, you should always make sure to have your dentist check that the sealant has not chipped or worn off. Sometimes you may not have to have sealants reapplied for ten years. That will enable you to keep your teeth in great condition and protect you from dental decay for a decade. Does Insurance Pay For Dental Sealant? Some insurance providers will pay for dental sealant as a part of preventative care. We can provide you with the information your insurance company will need to determine how much of the process they will cover. They may be covered in full or a copay may be required. With the increase of many sugary foods that have now become part of our children’s lives, dental sealants may seem like a good idea, but do kids need dental sealants? While many different credible sources talk about how important and beneficial these dental sealants are for kids, only about 20 to 40 percent of children actually get the coating. 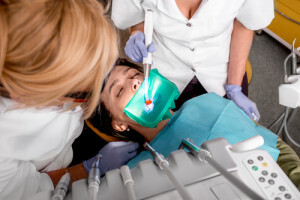 One of the main reasons is likely that people are not getting regular dental care for financial or sociological reasons, restricting the availability of dental care. While dental sealants aren’t necessary for kids, they do help combat cavities which means less need for fillings and much healthier teeth. Without this and other preventative treatments, children may face increasing difficulties and occurrence of oral decay and infection as they grow older requiring more invasive and expensive dental treatments. To keep cavities at bay, make sure that you brush at least two times a day — ideally before bed and in the morning — with an ADA-accepted toothpaste with fluoride. Using floss daily or another interdental cleaner is also necessary. Limit snacks and eat a balanced diet and of course, don’t forget to visit Dr. Nabi or Dr. Socoloff and talk about dental sealants and how they could help you.